Penn Fibre Plastics, Inc., an Ensinger Company, presented their new line of High Performance Forming Materials at the 13th Annual SPE Thermoforming Conference and Exhibition in Cincinnati. This new lineup has been developed specifically for the thermoforming industry and will permit processors a unique opportunity to participate in growing global markets that have previously been unavailable to them. New nylon offerings include both Pennite and DuPont™ Zytel® FS materials. Pennite nylons are available in type 6 and type 6/6 formulations with impact modifiers and glass filled reinforcement. The nylons are heat ageing stabilized, high viscosity materials with greatly improved melt strengths. Pennite nylons have continuous service temperatures of 140ºC (284ºF) and peak operating temperatures of 170ºC (338ºF). Standard color on these materials is black for service applications. Custom colors are available in production quantities. The material is available in coils from .010” to .093” thick and up to 24” wide. Sheets are available up to .250” thick, up to 48” wide. Oversized sheets and metric sizes are quoted on request. The initial target market for Pennite nylons are for high heat and under-the-hood applications. The first large scale commercial product is being thermoformed by Freetech Plastics, Inc. of Fremont, California utilizing Pennite® 4508, a type 6 material with 15% glass filler. 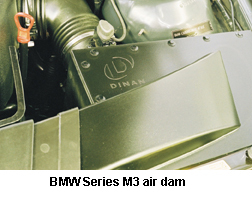 Their product is an aftermarket air dam for Dinan Corporation, the high performance BMW engineering company of Morgan Hills, California. The air dam is designed for BMW Series M3 automobiles. Pennite 4508 was selected for its mechanical and thermal properties, ability to meet the BMW material specifications for 15% glass filled nylons. DuPont Delrin Forming Solutions is the first and only thermoformable acetal. Delrin® FS offers thermoformers all of the great features that injection molders and fabricators have enjoyed for over four decades. The material is an ideal choice for applications that require a high strength-to- weight ratio coupled with exceptional scratch and wear characteristics and superior dimensional stability. Delrin FS provides a high level of resistance to solvents, fuels and chemicals combined with a low moisture vapor transmission rate. The markets include those already served by Delrin materials by other processes. These include medical, consumer electronics, marine, automotive and bearing and/or wear applications. These markets, which are already very well served with Delrin acetal through injection molders and fabricators, are very receptive to the economies offered by thermoformers with Delrin FS. An additional benefit is that it offers unique opportunities for topical decorating previously unavailable with Delrin acetals. This material may be painted, printed and enhanced with in mold decorating, foil stamping and more. A wide range of options are available with DuPont Delrin Decorating Solutions. Delrin FS is available in coils from .007” to .093” thick, up to 24” wide. Sheet stock is available up to .250” thick and up to 48” wide. As with Penn Fibre’s other products, oversized and metric sizes are quoted on request. The nat-ural color of Delrin FS is white and the material is available in a wide array of stock and custom colors. Glass filled and ESD formulations are also available on request. Fortron PPS (polyphenylene sulfide) is available in numerous formulations for specific applications including several that have been specifically formulated for thermoformers. Fortron PPS resins are manufactured for Penn Fibre by Ticona, a business unit of Celanese AG. Ensinger is the global leader of PPS products in extruded rods, plates and tubes as well as injection and compression molded products. Fortron PPS has a wide list of exclusive features. It is inherently flameproof, operates at temperatures in excess of 400°F and is vir-tually unaffected by a broad range of chemicals even over prolonged periods. Some of the markets being served with Fortron PPS include semi conductors, chemical tank lining, automotive, aerospace and electrical/electronic components. The introduction of this material to thermoformers is sure to increase its list of applications. The material is available from Ensinger/Penn Fibre in coils from .010” to .062” thick and up to 24” wide. Sheets are available up to .250” thick in widths to 48”. Stock shapes, injection and compression molded products are available through Ensinger Industries. DuPont™ Hytrel® (TPE) and their Surlyn® Reflection Series offer numerous opportunities for formers in niche applications for chemical resistance and extended mechanical properties. Automotive opportunities are prime applications for both materials. Solef® PVDF is available with and without fiber backings for forming chemical tanks and liners. PVDF provides exceptional resistance to aggressive chemicals at elevated temperatures. Ultem® is available in numerous grades including GE’s new higher heat formulations. From food service through medical and public transportation, Ultem® has always been a favorite when high performance is required. Udel® Polysulfone exhibits exceptional hydrolytic and dimensional stability with a high heat deflection temperature. Polysulfone is a natural choice for fluid handling and chemical resistance applications. When Ensinger/Penn Fibre made their decision to enter the thermoforming markets their goals and guidelines were clearly established. “Bring forth new materials that will add value and opportunity to new markets.” This new line of High Performance Forming Materials certainly shows their commitment to those ideals.